I recently went through Cry It Out (CIO) with McKenna and learned a few new things this time around. She was nearly three month old, so much older than my older two children were when they started CIO. Brayden started CIO at about 9 weeks. Kaitlyn started CIO at 5 days. McKenna was 12 weeks old. The reason she had never done CIO is because she never needed it. She didn’t cry at all before naps until then even though I put her down awake for every nap since 3 days old. The first several times she cried before naps, I went to her. I assumed something was wrong since she hadn’t cried in nearly three months before a nap. I found it odd. But I couldn’t find anything wrong with her. She didn’t cry before every nap. It was usually the third nap. Over a few days, it started creeping into other naps. Since I was used to her going to sleep rather quickly, I worried she would become overly tired and throw off her entire day, so I moved her to the swing. One day, she started crying before her first nap. This was when I knew I needed to start CIO. I knew I had her waketime perfect for her first interval and her crying was protest crying. At nearly three months, she was getting more and more social. I figured she was not pleased with her social hour ending. I don’t think McKenna hates naps like Brayden did (does), but I also don’t think she has the love of them that Kaitlyn did (does). She is pretty neutral, so if something more appealing is going on, she will choose that instead. Despite the fact that I have done this before, I found a book particularly worthwhile as I faced this situation. The book is Healthy Sleep Habits, Happy Child. Many of you blog readers love this book and wanted me to review it, so I had ordered it from Amazon, not knowing what it contained. It came a few days before I started CIO. This book is very helpful for doing CIO–but more on that in future reviews of the book. One Monday morning, I mustered up my resolve and was ready to face CIO. I was not excited. It isn’t fun. I had done the four S’s from The Baby Whisperer from birth, though we only ever needed to use the first three. I told my husband this was not fair; I had been careful and diligent and did not want to start CIO now. He told me if anyone could, it was me. So I faced the music. Well, she must have sensed my resolve. She didn’t cry for long. It was only a few minutes. Perhaps I should have allowed her to cry a bit in the first place? By her third nap, she wasn’t crying at all anymore. She did take a long time to fall asleep, though. I sat and watched her in the video monitor. I was tempted to run up and put her in the swing so she would be able to get a good nap in. I told myself no. For whatever reason, she was needing to re-learn how to fall asleep on her own. I needed to leave her be and let her fall asleep. She wasn’t even crying! I needed to be patient and allow the learning process to happen. Waketime Length: I finally figured out her optimal waketime length for all but one interval (that is the last one). She goes to sleep fine for it, but takes a short nap. This might be totally normal, though, since she is old enough to be having a short fourth nap. Stimulation: In Healthy Sleep Habits, Happy Child, Weissbluth states to expose your child to lots of stimulation so he will be tired enough for nap time. I realized I was still trying to protect McKenna from stimulation like I had when she was a newborn. I needed to start exposing her to more stimulating activities now that she was older. This seemed to help a lot. Darkening: Also in Healthy Sleep Habits, Happy Child, Weissbluth says to darken the room for naps. Hogg (the Baby Whisperer) also says to do this. Now, I did/do this with Brayden and Kaitlyn, but their rooms have white blinds. It darkens the room, but it doesn’t make the room dark. With McKenna, we went with dark brown blinds. They really make the room dark. I didn’t want her to require a dark room to sleep. However, I decided to give it a shot. I decided that she sleeps at home most of the time and if she needs a darker room to sleep, she needs a darker room! There is no logical reason to fight it like I was. This also rippled into keeping her room much, much cooler so it isn’t so hot in the afternoon. Eye Contact: Before I would leave the room, I would look McKenna in the eye and tell her to go to sleep. That seemed to help. In the end, I think it was really good for McKenna to have had the four S’s from the beginning. It was an easy, gentle way to help her sleep (though keep in mind that we never had to get to the fourth S). As she got older, she didn’t like being held before the nap so I stopped it. Eventually, she started crying before naps. Since she already had skill at going to sleep on her own, the crying was not prolonged once we started CIO. I'm glad you mentioned HSHHC. I did Babywise from birth with our daughter but I didn't feel CIO was well addressed in the BW series. At 3 months DD went through the same change as McKenna did(she had previously went down awake but tightly swaddled) and she was also going down w/o crying by the 3rd nap on the first day we did CIO. It was great! I can't wait until you review HSHH. It was a total lifesaver with Olive. I think the best thing about that book is that it is written in such a way that you can employ it with whatever method you choose. If you do attachment parenting there's something in it for you. If you are a parent directed feeder, it works too! I also really like that it helps you know that it isn't the end of the world if your baby is only sleeping for an hour. It just gives you more tools for your parenting toolbox. I will say, however, that without something like Babywise or Babywhisperer it would an incomplete sleep training system. My daughter is just about to be 5 months old and we are experiencing some difficulty with naps. She sleeps through the night and has since she was about 8 weeks old. And I have done CIO with her. She seems to have mastered her morning nap, but her other naps she doesn't do so great. She will fall asleep with little or no crying but 30-60 minutes into it she wakes up. I know about the 45 min. intruder but I can't seem to shake it. There doesn't appear to be anything specific that wakes her up. I have also tried letting her cry a little in order to fall back asleep. (Sometimes she does but she only sleep for another 10 minutes or so. I know she is still tired because she wakes up cranky and when she has had a good 1 1/2 hour or 2 hour nap she is happy when she wakes. Any suggestions? I am so grateful for your blog and have scoured the pages and posts over the past months as we've implemented BW with our first. I have a Nap/Sleeping question regarding our almost 8 month old little girl. We've done BW from the beginning with her and have pretty much found her to be by the book. I've also found the Baby Whisperer to be very helpful. We've had nap issues from pretty early on, though (probably 3-4 months of age). Maddy is extremely inconsistent with her naps – sometimes taking a two hour nap and other times a 45 minute nap. At 7 1/2 months, we are currently down to two naps a day with an optional late afternoon catnap if needed (which it still often is). As I understand it, she should be sleeping 1.5-2 hours for each nap in order to be well rested and get good nighttime sleep. She sleeps very well overnight for the most part – a solid 12 hour night with a dreamfeed at 10p. We have noticed, however, that about once a week she seems to have a bad night's sleep – fitful, waking up, crying out, etc. I usually attribute it to teething, but she's yet to pop a tooth so I can't know for sure. Anyways, her daytime schedule – or at least our attempted schedule – goes something like this: wake 7a, nurse 7:30a, solids 8a, independent play, together play, nap 9a; wake 11a, nurse 11:30a, solids 12p, play/outings, etc., nap 1p, wake 3p, nurse 3:30p, solids 4:30/5p, bath 6:15p, nurse 7:00p, bed. The trouble is she is consistently napping only 45 minutes-1 hour. This throws off the whole routine and necessitates a catnap – often her longest nap of the day (because she's so tired at this point!). I have tried watching her waketime amounts and have put her down both early and late with no consistent observable difference. I have debated simply accepting her short naps (especially since she's generally a good nighttime sleeper), but she almost always wakes up cranky from her short naps and I know that's a sign that she's still tired. It breaks my heart to see dark circles around her eyes all the time and she's simply not herself on these short naps. I would give anything to know the reason and/or to find a way to help her get longer naps! Any suggestions or insight?!? I'm glad to see that you had success combining both Babywhisperer and Babywise. We started sleep training very late with our son and so we used the pick up/put down method from Babywhiperer. This helped him get the idea of going to sleep on his own but it didn't always work. After a few weeks, I switched to CIO and it only took him a few days before he stopped crying for longer than 5 mins. I think a combination of Babywhiperer and Babywise works really well! About the room darkening, my 11 1/2 month old has been a perfect little BW baby until he was ten months and started to move around, crawling, pulling up, rolling over etc, all in the same couple of weeks. I have struggled with his afternoon naps ever since. He just plays and plays. I actually posted a question to you about this a few weeks ago somewhere. But then someone mentioned to me making sure his room is dark. He already has shades, curtains and one more layer over each of his windows, but his room was not pitch black. So I removed his night light which he had slept great with up until then, and made sure there was no light peeking through the windows. He has been taking great naps all week now. So I guess some babies just need the dark! And for him, this as something he grew into when he became active. I can't wait to read your review of HSHHC!! I think it's something to add to our "parenting toolbox" as PP put it, but hubby seems to think we have things "under control". Ha! So he thinks…for now! I have a question..my 8 week old is starting to STTN with some help. She is on a 3 hr schedule with her last feeding falling between 10 and 11. The problem is she wakes up aroung 4 and I have been letting her cry it out. She crys for around 45 min then sleeps till 7am. I have been doing this for a week now and although the CIO has gotten less..started 1 hour to now 45 min. she is still waking up. It is exactly a week now of this. Should I give-in a feed her at 4 or wait it out an dhope she will stop crying soon. Not sure if she is waking up out of hunger or habit. Before when I used to feed her at 4am she would not finish her feeding thats why I assumed it was waking out of habit and so I started CIO. Am I depriving her of food? not sure what to do now. She is getting 6 feeds a day at about 4oz at each feeding..Is this enough or should I add another feeding. Thanks for your help. I am working on putting my LO down for naps, but have hit some roadblocks. The biggest is that I work 3rd shift so CIO is VERY difficult. In order for him to CIO (he is 11 weeks) I am literally going without any sleep. My husband doesn't have quite as much resolve as I do (which isn't much sometimes either) and can hardly stand for him to CIO. Any suggestions? I want our baby to benefit from putting himself to sleep and I also want him to get the sleep that he needs. Thanks for your great blog too! I'm planning on checking out the books you have suggested. God bless! Ditto on what Jennifer said on July 10th about her 5-month old's napping pattern! I am experiencing the EXACT same thing with my almost 5-month old daughter. Any suggestions? Ashley, thanks for sharing! I am glad McKenna wasn't the only one! I was not pleased with the development–lol. Natalie, it will be coming. I want to finish my other book reviews first (Making Children Mind and Baby Whisperer) so I just have one going on at a time :). I agree that it would be incomplete by itself. And there are things I definitely don't agree with. But it is worth the read and great as a resource. Jennifer, first, are you positive she is falling asleep? I ask because with my video monitor, there was a time McKenna would start to cry 20-30 minutes into the nap. She was 100% silent up until that point and I would have thought she was asleep but knew she was awake because of the monitor.If she is awake, she might need a longer waketime. Also, there is a post dedicated to 5-8 month sleep problems. It is under "Sleep" (or sleep problems?) in the blog index. mamunaco,See the 5-8 Month sleep disruptions post. Also, sh might not be sleeping well at night because she might need the dreamfeed dropped. 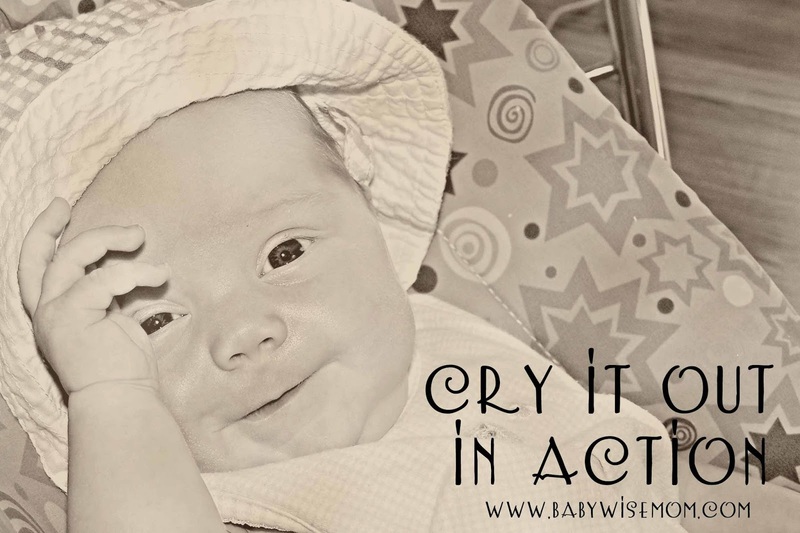 Even the Baby Whisperer (who says to drop it late IMO) says to drop it at 8 months. It starts to interfere with sleep patterns.Usually for a child that age, short naps is because of too short of a waketime. Start with focussing on the first waketime of the day. 2 hours is probably long for an 8 month old. It will take some time to find that right number because even 5 minutes can make the difference. Once you get the first waketime length down, you can figure out the next ones. The first is usually the shortest of the day. Thanks for sharing Janelle! I agree. Thanks thesprian! That is good to know. I agree that some babies need it darker than others. And since he is old enough, you don't need to worry about day/night confusion. 24hrMommy,That is something you will have to decide. But it seems I answered a similar question from you on this today and the time was 3 AM? So it probably wasn't habit. In general, baby needs 2.5 ounces per pound of body weight a day. So a 10 pound baby would need 25 ounces. Spread that out over 6 feedings a day and baby would need just over 4 ounces per feeding. You can find calculators for ounces on kellymom.com. I have a question: I have a two-week old baby boy who doesn't cry at all if he's within touching distance of me when he's falling asleep, which means him falling asleep in his crib is difficult. He is a drowsy eater, (I constantly have to wake him up to get full feedings) so when he's done eating usually falls asleep. This is great at night, but during the day I purposefully keep him up for waketime. Once I do put him down for naptime, he'll cry a short whimper, then stop. Then a few minutes later, there's another short whimper or two, and then hestops. After about 8-10 minutes, he'll full out cry for no more than five minutes. My question is when does the fifteen minutes start the BW says you should go in after? From when you first put him down, which would include the little whimpers? Or once he's actually begun crying?Also, it seems to help if we go in and pat his back after about 5 minutes- he'll stop crying immediately, but it only lasts for a minute or two once we've left the room. Is that helping, or is it just prolonging the process?Also, I read on another post that with newborns this young, that it's not detrimental to the BW program to rock your baby to drowsiness before putting him down. I'd love to do this, but will it negate the whole, "go to sleep from being awake" thing?Thanks so much! Caitlin,You will have to decide when "15 minutes" is up. Keep a log of how he does when you go in…it is a process.If you want to do a patting thing, I suggest you see the book "The Baby Whisperer Solves All Your Problems" for a method on that.How he reacts to rocking to drowsy long term will depend on his personality. For my oldest, it would have been bad news, but for my girls, okay. So you will have to try to figure that out based on his personality. I have a 10 week old who is pretty good. 50% of the time she'll go down easy for naps after I've done our short routine and calmed her in my arms. Naps are usually too short, but that's another issue.Night time usually takes about an hour-2hrs to get her down. I don't know why she goes down easy for naps but not bedtime. I know she can put herself to sleep, I've seen her do it many times. She just doesn't do it for bedtime.some nights she's obviously overtired, and that's why she's not going down easily. But most days we make sure she gets a nap before her bedtime routine so she's not overtired.Im wondering if dong some CIO training would just do the trick? I have never let her cry that much, so Im a little scared at my reactions to it, but on the other hand Im feeling like I really want to get this right for her sake and ours. bluesweater,I would recommend you read the post on Witching Hour first to make sure that is not the issue.If not, work with her waketime length. Good luck! I've been reading your blog for the past few weeks trying to get up the nerve to let my son CIO. He was an excellent sleeper (and still is at night) until about 4 or 5 weeks where he needed more and more sleep props to go to sleep and stay asleep. This was the same thing that happened with my first, and we let him cry for sleep at about 3 months. The crying was pretty short lived and he is an absolutely amazing sleeper at 18 months. My second son is now 8 weeks. For two days i have let him cry for naps and bed. Sometimes he goes down without any fuss at all, and others he cries quite a bit. THe worst i saw for a nap today was 11 minutes. I was always told that newborns do not have the ability to self soothe, so i'm always confused about whether letting babies cry for sleep this young is responsible or not. I have seen some improvement from where I was a week ago with him, but I'd like to hear what I should really expect from a two month old. 11 minutes doesn't feel like too long for me to be comfortable, but will 11 minutes turn into less than that soon? NDH, In my experience, it should turn into less soon. I agree 11 minutes isn't long so you must be doing a great job of getting him down at the right time. It is possible if you put him down a bit sooner he would cry less. It should only continue to get better over time. Caitlyn, Most do stop. There are a handful, however, who don't. I have a good friend whose oldest son did that. Even close to two years old, he would cry for 10 minutes or so before a nap. My 13 week old daughter has been going to sleep pretty well with a paci but she wakes up at 45 minutes and cannot go back to sleep. I feel like the pacifier has become a sleep prop, should I remove it and let her CIO? I tried this today and she was able to CIO for most of her naps. I went in to check on her similar to the Ferber method. Will eliminating the pacifier teach her to fall back to sleep at the 45 minute intruder? She wakes up at 45 minutes (or sooner) every nap for the past month. It's not an occasional thing. She does sleep pretty well at night although she's started waking up more frequently recently. Mary, you will have to decide with the pacifier. This is the main reason I do not use a pacifier.However, moms who have success with the pacifier say they have a rule of "one reinsertion"–so they would put it in, if it fell out, they would go in once and reinsert, and if it fell out again, they wouldn't reinsert it again, so iit would go to CIO at that point.See the pacifier post for more from moms with experience on this. Hi there! Thank you so much for your blog and insights! I have followed your posts and reread so many threads over the last 10 months. You have helped so much.My question is regarding my 10 month old son – I started babywise from the beginning with him and had to use CIO for naps and nighttime sleep and after he got over it, it was blissful for months. Lately he has had a very difficult time with his second nap (he is down to 2 naps daily). He fights it very hard, and often times skips it all together. I know he still needs to sleep because if we go out in the car, he will fall asleep. Do you think he is ready to drop his morning nap (he still sleeps well for that one)? Or do I need to revisit CIO for naps? Do you think he has regressed or is going through a sleep regression and at some point will be back to "normal? "I have played around with his wake time, and before this "regression," he was awake for 2 hours before each nap. Do you think it needs to be extended in the afternoon? His sleep cues are fussiness and he clearly displays that in the morning, but has dropped all signs in the afternoon.Thank you so much for your input and time! I truly appreciate it! Hello! I would definitely extend time before the second nap. It is totally common to have to do that. I've been trying to sleep train my 4-week-old since week 2. At first she was pretty easy because she was so, so sleepy that the hard part was actually getting her to wake up at all. She would go back to sleep pretty quickly. But as her wake times are getting better, her going to sleep is getting worse. I definitely see the "progress is a spiral" that you refer to, as she'll have a couple awful days, followed by a few good ones and then another couple bad ones. We're in the middle of a bad stretch right now, and I'm having a problem that I haven't been able to find an answer to on your site yet. Maybe I am just missing it, and you can point me to the right posts… Anyway, I have read some of your posts on waking early, but I wouldn't really call this waking early. If I set her down at the exact right moment, and she only fusses or cries 2 to 5 minutes, she's usually OK. But at the times she cries longer, which is still almost always less than 10 minutes, she will wake continually for the rest of the next cycle, or until I rescue her. Sometimes she'll cry back to sleep in 5 minutes, but then she'll wake within 5 minutes. Then she'll cry back to sleep and then wake within 15 minutes. This will repeat until I go get her. I really don't know what to do to stop this, and I'm starting to feel that the sleep training is actually making things worse! And I hate feeling that way because we are strong believers in CIO – we did it with our son, though he was a little older, and he is still a good sleeper at almost 2. I'm completely at a loss as to what to do, and I really don't want to give up. OK, update… To ease my mind, I gave in a little and put her down for a couple naps here and there already asleep, and she had the same issues as when I let her CIO. So that at least confirmed for me that the repeated waking issue was not due to CIO, which was a big relief. Thus we've continued to work on the CIO. She's improved even since 4 days ag, and seems to be doing really well with that. And I think we've determined that the repeated waking is due to gas, though I haven't been able to determine a pattern yet that would cause some days to have no issues and others to have so many. I read your posts on gas, so trying some of your tips there. We're already using the gas drops, although I'm not sure I can tell that it helps. But I'm going to try your advice to give it consistently as a preventative, and not as relief after the symptoms appear. I also ordered the gripe water you mentioned. Thanks for all you do. Hoping some of these things help. I hate to see her suffer. Glad you are figuring things out! I have had two who really. Needed gas prevention for a long time. Once you get things consistently going for prevention, she should really improve if that is the real cause. I had a quick question. My 4-5month old was sleeping through the night a good 9-11 hours. But after Christmas party's and such she has gotten way off and wakes up all over the night wanting a pacifier. We have a pretty strong willed girl. And she is a big screamer. Had 3 hour screaming fits due to tummy problems, but once we fixed that she would still have screaming fits if it was to busy of a day. But we have tried CIO for a nap a few times and at night and she goes an easy 2hours going on 3, with the naps she can cry right to the next feeding……… I am so confused. Any help would be great. Thanks! With the tummy problems she did a 5 hour too. And it's not just crying! It's screaming hysterically and choking and screaming and she does it for 3 hours…. If I CIO do I just let her go 5 hours, tell she's so tried she falls asleep? Hi! I have a 8 week old who had become IMPOSSIBLE to get to sleep for naps and bed time. We were rocking her to sleep, which was stupid because we should have known from our first daughter that it wasn't sustainable. Anyways, she's at the point where I have to hold her all day and half the night to get her to have any decent sleep. Tonight I was so exhausted that I let her cry and went in at controlled intervals, and she was asleep after 50 minutes. We did this with our older daughter around 12 weeks and had great success, but she was also a very consistent night waker that would be up once to eat and fall right back to sleep. My second daughter is not so easy in the middle of the night, and has had to be rocked and held for the last few weeks. I'm wondering what your advice is regarding handling night feedings and if we should let her cry it out in the middle of the night the same as we would during the day?